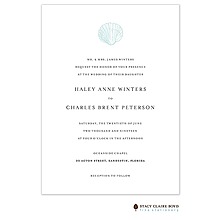 A sophisticated script design highlights your wording on this beautiful wedding invitation! The backer card completes your look. Two little love birds add big romance to this ecru wedding invitation. Choose the ink color for your wording and the design for style.